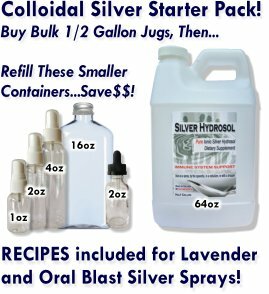 Amazed with your colloidal silver hydrosol products! Hi! I just had to share all the success we have had with your colloidal silver hydrosol products. Not only do my husband and I use silver as a daily supplement and for our abrasions and such, we also use it on our animals. We have had great success with minimizing getting sick by using silver. We also use it to stop the doggie smell from 2 large dogs and to help with flea control and scratches on our cat. Being into raising and growing our own food supply we have also used it in treating knee abrasions on our goats (they healed within days). 2 days ago one of our rabbits had a bad scratch near her eye. We sprayed the eye along with the scratch and today she has no scratch! The list goes on as we use the cinnamon, peppermint, spearmint and lavender sprays as well. Your customer service is outstanding!!!! Great quality at a fair price with fast shipping keeps us coming back!!! We are recommending your products to everyone we know. God Bless you for what you do!!!! P.S. If you had a lip balm available we would buy those too!